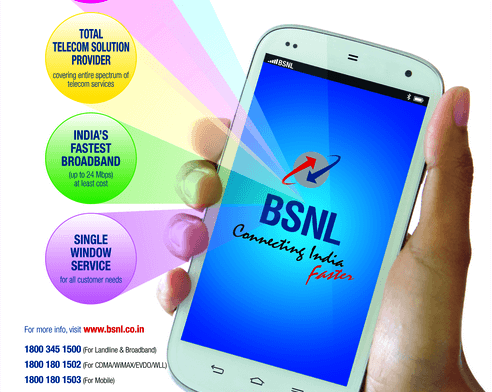 PAN India 3G service provider, Bharat Sanchar Nigam Limited (BSNL) has announced the revision of its existing 3G/2G prepaid data stvs from 13th February 2016 on wards on PAN India basis. As per the latest information, BSNL will be revising its most popular and best selling Data STVs like Data STV 68, Data STV 155, Data STV 198 & Data STV 252. In addition, BSNL will be launching one new data pack with MRP of Rs 4(+3) which offers 20 MB Free 3G/2G data which has to be consumed before 23:59:59 hrs of the day of activation. *Rs. 10 extra commission OTF to retailers for the month of March’ 2016 with revised Data STV 291. #The New Data STV 4(+3) will be valid till 23:59 hours of the calendar day of activation, irrespective of time of Recharge during the day. The circles may implement subject to technical feasibility. All the other terms and conditions will remain same.The above tariff will be applicable from 13.02.2016 on PAN India basis. The implementation of the tariff will be made in accordance with 43rd Amendment of Telecom Tariff Order and orders/guidelines/clarifications issued by TRAI from time to time. Dear readers, please share your views and opinions about this latest Prepaid Data tariff revision by BSNL via comments with us. Lol....increasing charges and asking to share...who wil take bsnl..? Which one is cheaper ?? ?